U.K. Medical Staff Who Treated Ex-Spy And His Daughter Did Not Expect Them To Survive : The Two-Way Doctors and nurses took steps quickly that saved the lives of Sergei Skripal, 66, and his 33-year-old daughter, Yulia after they were attacked with a deadly nerve agent on March 4. 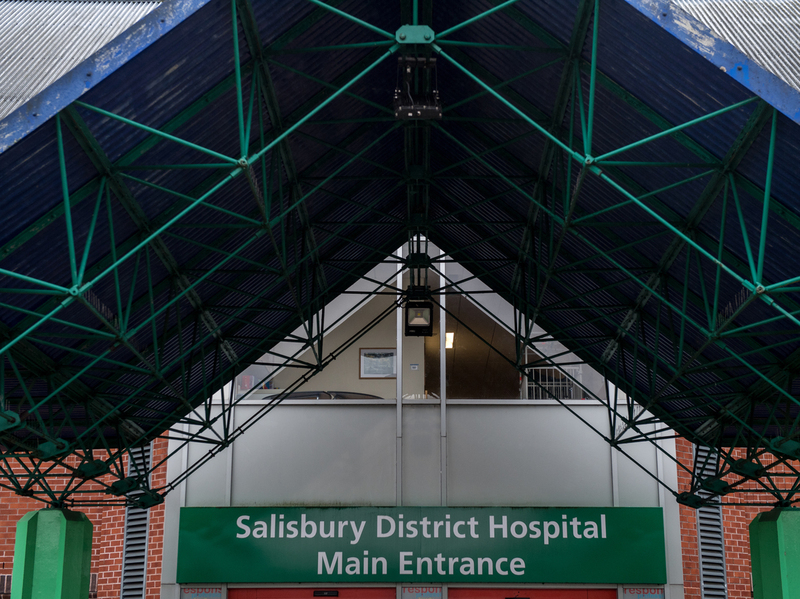 The main entrance to Salisbury District Hospital as Yulia Skripal is discharged from the hospital on April 10, 2018 in Salisbury, England. Russian ex-spy Sergei Skripal and his daughter Yulia Skripal were attacked with nerve agent Novichok in Salisbury on March 4. When former spy Sergei Skripal and his daughter, Yulia, were admitted to a hospital in Salisbury, England, in early March, medical officials first thought they might be dealing with a drug overdose. Then possibly an infectious outbreak. When staff at Salisbury District Hospital finally realized it was a deadly nerve agent known as Novichok that was developed in Soviet Russia during the Cold War, they held out little hope of saving the Skripals, according to interviews the BBC did with hospital staff. Lorna Wilkinson, the director of nursing at the hospital, says after it became clear that the Skripals — who were found unconscious on a bench at a local shopping center – were not suffering an opioid overdose, concern turned to the possibility of a disease outbreak. She said when the Skripals and Police Detective Sgt. Nick Bailey who was among the first responders to the scene of the poisoning, all presented with similar symptoms, "There was real concern as to how big this could get." "Have we just gone from having two index patients having something that actually could become all-consuming and involve many casualties? Because we really didn't know at that point," Wilkinson told BBC Two's Newsnight that she remembered thinking. Nonetheless, the steps taken early on — a quick arrival in intensive care, heavy sedation to stanch any brain damage and getting advice from Britain's chemical weapons experts, saved the lives of Sergei, 66, Yulia, 33, and Police Det. Bailey. 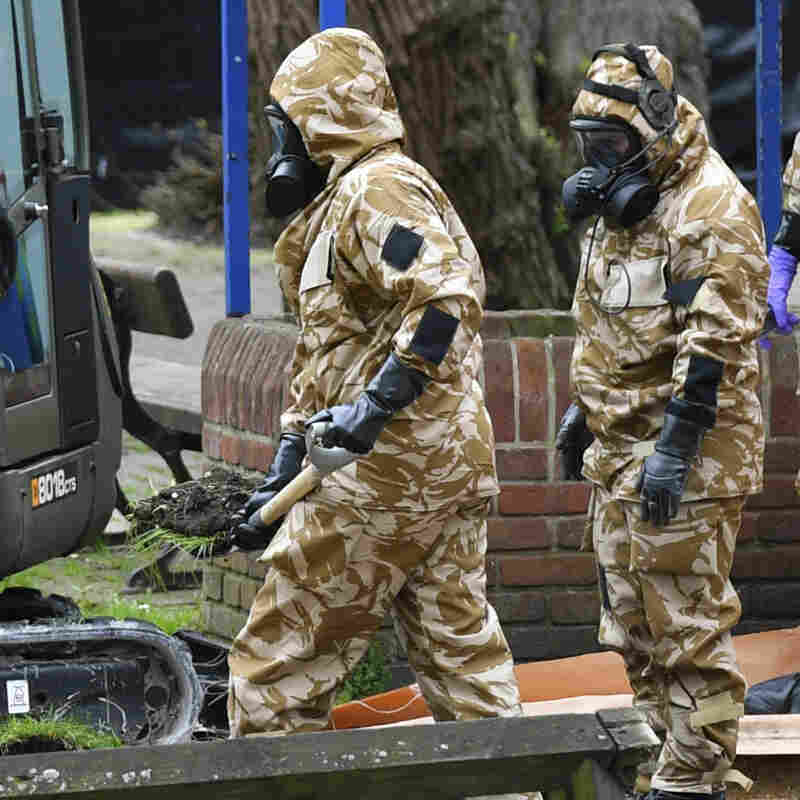 In April, Military personnel dig near the area where Russian agent Sergei Skripal and his daughter Yulia were found on a park bench, in Salisbury, England. Sergei Skripal, a retired military intelligence officer who was convicted in Russia of handing over to Britian's MI6 the identities of Russian spies working in Europe, was sentenced to a 13-year prison term in 2006, but was later released and, as part of a prisoner swap, sent to the U.K., where he became a British citizen. Yulia is a citizen of Russia. When police learned that Sergei was a former spy and "having been admitted to the hospital in pretty unusual circumstances," Dr. Duncan Murray, the hospital's senior intensive care consultant, says staff began to understand that the symptoms they were seeing were typical of nerve agent poisoning. "When we first were aware this was a nerve agent, we were expecting them not to survive," Dr. Stephen Jukes, another intensive care consultant at the hospital, told BBC. "We would try all our therapies. We would ensure the best clinical care. But all the evidence was there that they would not survive," he said. The hospital got advice from experts at a U.K. laboratory for chemical, biological, radiological and nuclear warfare, commonly known as Porton Down. Medical staff needed to stimulate the production of an enzyme, acetylcholinesterase, in their patients – needed for normal functioning — but that was suppressed due to the Novichok. Even so, it was "good generic, basic critical care," that counted the most toward the survival of the three patients, Murray said, praising the "excellent teamwork by the doctors, fantastic care and dedication by our nurses." Sergei Skripal and Police Det. Nick Bailey were discharged earlier this month, weeks after Yulia was sent home.